With an up-tick in insurgent activity these last two weeks, Deuce-Four is focusing on inserting themselves a few links further up the chain reaction that is the typical car bomb attack here in Mosul. Deuce-Four rolled into a car service garage, following a tip that had them searching every car. There they found a car bomb, on the scale of the one that detonated in the crowd of children last Monday, killing baby Farah. Deuce-Four soldiers questioned several men, taking two into custody. The next day, on patrol in the same area, I was riding in the belly of the command Stryker, with the radio pressed to my ear, listening to LTC Kurilla, who was standing in the Vehicle Commander's position, giving instructions to his men. There was constant communication between all four of our Strykers. "Keep an eye on that white car at 2 o'clock." "Roger, got him, he's pulling away." We patrolled for the telltale signs of insurgent activity, searching the crowds for the men whose faces the American soldiers have memorized. The radio still pressed to my ear, I peered into the machine gun's television monitor. LTC Kurilla was standing about two feet away from me, holding his rifle and scanning from the Vehicle Commander's position, when he gave the driver directions over the intercom. "Head down past that garage where we got the VBIED yesterday." As we passed the garage, five terrorists happened to be standing there. The Strykers are large, but quiet, and we managed to surprise the enemy. "Stop!" Kurilla yelled at the men who had started to scatter. I could see one of them on the screen, pulling out a pistol just as he started running . . . bam! bam! bam! bam! bam! "Shoot him Munch, he's running for the trailer!" Kurilla commanded, but Munch did not have time to shoot. I saw dust splash, as Kurilla kept firing his rifle at the man, who disappeared between some parked trucks. When Kurilla said, "Drop ramp!" Will Shockley, Q, and Sergeant Major Prosser all ran out the back and I followed. Kurilla was right on my heels. The other three Strykers halted, dropped ramps and about twenty soldiers swarmed out, ready to shoot, running toward the open garage, with a few staying behind to man the big guns. We'd barely made it inside the garage when we saw the man laying face down, barefoot, in filthy, oily mud, human excrement all around him. His 9mm pistol on the ground. He had fallen in an open air toilet, where he lay, belly-shot. He looked at me, blinking but making no sound. The soldiers quickly caught and detained the four other men; all five were known terrorists. Soldiers were flex-cuffing the injured man when they saw his massive wounds, and Kurilla ordered the men to cut him free then yelled for a medic. 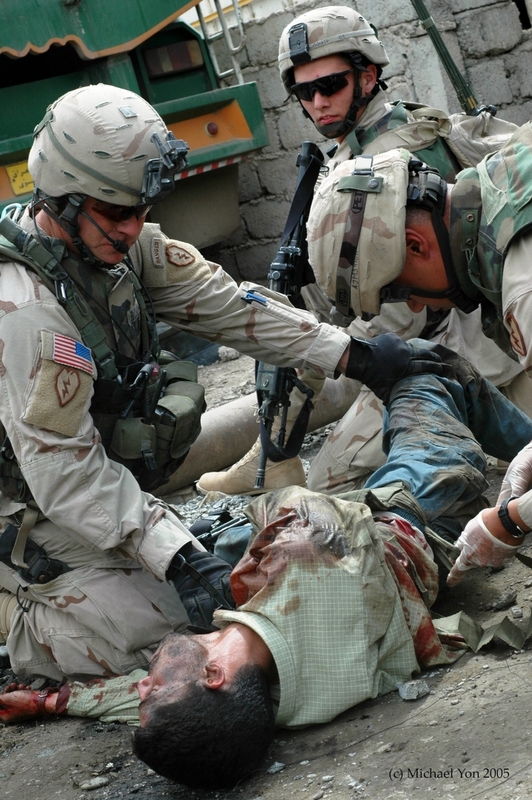 While the medic tried to stop the bleeding, SFC Robert Bowman began questioning the man through a translator. "You are going to die," Bowman said, "I want you to answer some questions." The man brought his hand to his head, and touched his forehead with his index finger, pointing right between his eyes. "Shoot me, shoot me," he said, "I want to die." LTC Kurilla ordered the medic to try to save him. So they took him to same hospital where Sgt Davis died last week; the same one that little Farah never made it to, and there he is, still alive, his bombing days are over.